The world's largest cryptocurrency ended November down 37 percent, its worst drop since April 2011 when the cryptocurrency fell about 39 percent, according to data from CoinDesk. The market capitalization of all major cryptocurrencies took a $70 billion hit for the month, according to CoinMarketCap.com. XRP, the world's second largest cryptocurrency, dropped 18 percent in November while ether fell 43 percent in the same time period. 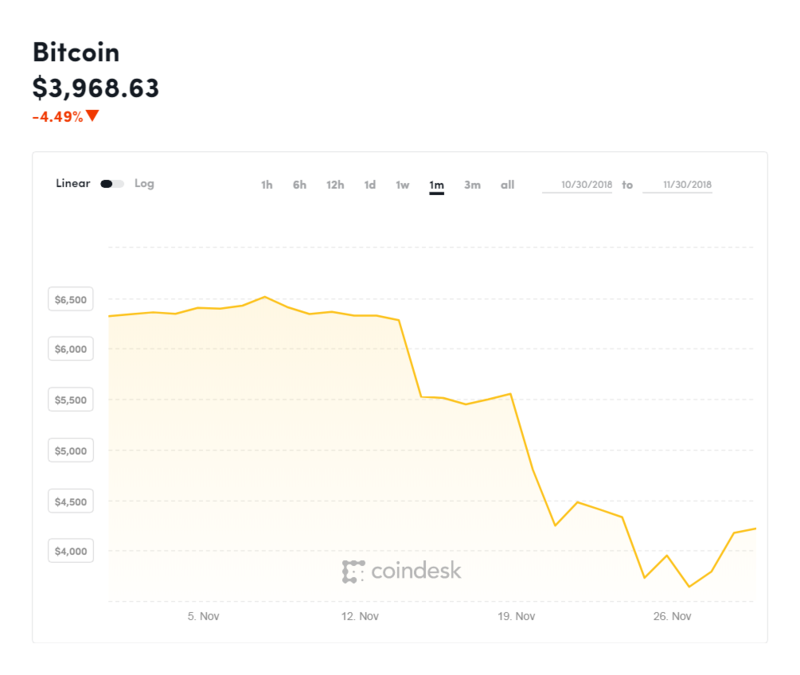 For bitcoin, this month's price performance was a stark turnaround from its relatively stable October. The cryptocurrency traded near $6,400 without much volatility as global markets fell. Michael Moro, CEO of Genesis Global Trading, said "it didn't take much for the price to break down" after bitcoin failed to stay above the key support level of $5,850. "It's unclear if this is a 'bottom' or a brief period of consolidation before next move down, but buyers are still maintaining some cash on the sidelines in case it does go lower," Moro said. The CEO also pointed to a "messy" fork on the bitcoin cash network. That digital currency split into two versions: "Bitcoin ABC" or "Bitcoin SV," short for "Satoshi's Vision" in mid-November. "While the split occurred on a different blockchain, there were still spill-over effects on other cryptos, including bitcoin," Moro said. The Intercontinental Exchange is backing a version of bitcoin futures through a start-up called Bakkt that goes live in January. Nasdaq and VanEck also confirmed they are planning to launch multiple cryptocurrency products, which include bitcoin futures in the first quarter of next year. Regulators stepped up enforcement of initial coin offerings in November. The Securities Exchange Commission announced its first civil penalties against founders who did not register new coin offerings, adding to its crackdown aimed at abuses and outright fraud in the growing digital industry. This week, the agency settled with pro boxer Floyd Mayweather and music producer DJ Khaled, who the SEC said pumped up initial coin offerings without telling investors they were getting paid a promotional fee. This is not a good year for bitcoin. Real bad time for bitcoin investors. But might not be too negative an environment for miners. The drop in value is absolutely jaw-dropping.